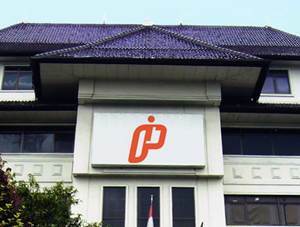 PT Perusahaan Perdagangan Indonesia (Persero) - PT PPI (Persero) or later known as "PPI" is an Indonesian state-owned company that is involved in trading business. Based in Jakarta, PPI has strong business competencies in distribution, export, and import. The Company has main trading commodities in hazardous chemicals, fertilizers, pesticides, construction materials, agro products, consumer produces and assets. PT Perusahaan Perdagangan Indonesia (Persero) is non listed state-owned company and is 100% owned by the Government of Indonesia. PT Perusahaan Perdagangan Indonesia (Persero) was formed in 2003 under the Government of Regulation No 22 of 2003, dated 31 March 2003 as a merger results of 3 state-owned trading companies; PT Dharma Niaga (Persero), PT Cipta Niaga (Persero), and PT Pantja Niaga (Persero). PT Perusahaan Perdagangan Indonesia (Persero) now has 34 branch offices spread across Indonesia. the Company also supported by 2 subsidiary companies; PT Dharma Niaga Putra Steel (99.90% owned by PPI) and PT Trisari Veem (60% owned by PPI). In term of financial performance, PT Perusahaan Perdagangan Indonesia (Persero) managed to record total revenue of Rp 1,224.8 billion in 2014. This total revenue reflected a 17% down from Rp 1,484.6 billion in 2013. The Company reported total loss Rp 37.5 billion in the year 2014 as compared with profit of Rp 18.3 billion in 2013. This figures was stated by the Ministry of State-Owned Enterprises (Kementerian BUMN) in its State-Owned Enterprises Profile 2014 as cited by JobsCDC.com. Minimum Bachelors Degree (S1) majoring in Mechanical Engineering, Protective Services, Management, Law or equivalent.. Minimum GPA of 3.00 from reputable university. Minimum 5 years of working experience in the related field is required for this position, preferably as Manager/Assistant Manager specialized in Security/Armed Forces/Protective Services or equivalent. Have good skills in following areas : K3, Microsoft Office, management, unified communications. Possess certification in K3 will be an advantage. Able in handling all fire and safety equipment of building. Minimum Bachelors Degree (S1) majoring in Engineering (Civil), Engineering (Mechanical), Architecture or equivalent, minimum GPA 3.0 From Reputable University. Minimum 5 years of working experience in the related field is required for this position, preferably as Manager/Assistant Manager specialized in Maintenance/Repair (Facilities and Machinery) or equivalent. Have good skills in following areas : Building and Facilities Management, Especially Office Building, Microsoft Office, Unified Communications, Negotiation, Presentation. Target oriented and excellent supervisory and team building skills. Strong leadership, organizational and planning skills. Possess certification in facility management will be an advantage. Minimum 3 years of working experience in risk management, preferably as a Staff (non management and non supervisor) specialized in Finance General/Cost Accounting or equivalent. Have a good knowledge of the trade. Have background in risk management. Have good skills in following areas : Microsoft Office, ERP System, Finance, good written and presentation communication skills. Minimum Bachelors Degree (S1) majoring in Computer/Telecommunication Engineering or equivalent. Minimum 3 years of working experience in the related field is required for this position, preferably as Senior Staff specialized in IT/Computer Network/System/Database Admin or equivalent. Have good skills in following areas : Application Server, Active Directory, Email Server, Data Server, Antivirus, System Network, VPN, WAN, Network Security. Minimum Bachelors Degree or Master Degree (S1/S2) majoring in Computer/Telecommunication Engineering. Minimum 5 years of working experience in the related field is required for this position, preferably as Manager/Assistant Manager specialized in Information Technology or equivalent. Minimum Bachelors Degree or Master Degree (S1/S2) majoring in any fields (preferably Accountancy, Management, Business Administration, Commerce Administration). Minimum 5 years of working experience in the related field is required for this position. Able to work in target. Minimum Bachelors Degree (S1) majoring in Finance/Accountancy/Tax or equivalent. Have good skills in following areas : accounting, tax and verification. Minimum 5 years of working experience in the related field is required for this position, preferably as Manager/Assistant Manager specialized in Accounting, Taxation and Verification equivalent. Minimum Bachelors Degree (S1) majoring in Administration, Mass Communication, Public Relation or equivalent. Have good skills in following areas : Industrial Relation, Design Application, good written and presentation communication skill. Fluent communication skills and enjoy outdoor activity. JobsCDC.com now available on android device. Download now on Google Play here. Please be aware of recruitment fraud. The entire stage of this selection process is free of charge. PT Perusahaan Perdagangan Indonesia (Persero) - S1, S2 Staff, Manager PPI May 2017 will never ask for fees or upfront payments for any purposes during the recruitment process such as transportation and accommodation.